Summer, What a wonderful fresh time of year! I was in my garden yesterday and noticed the tomatoes are beginning to grow. Just a matter of time now. Well today I was craving fresh tomatoes so I went for my salsa that almost tastes like I just picked the tomatoes from my garden. This salsa is fresh, easy and delicious. First Rinse the petite tomatoes in a colander very well and drain all liquid. Add additional ingredients and mix. It’s good to chill in the refrigerator for 30 minutes before eating. Hey Linda! 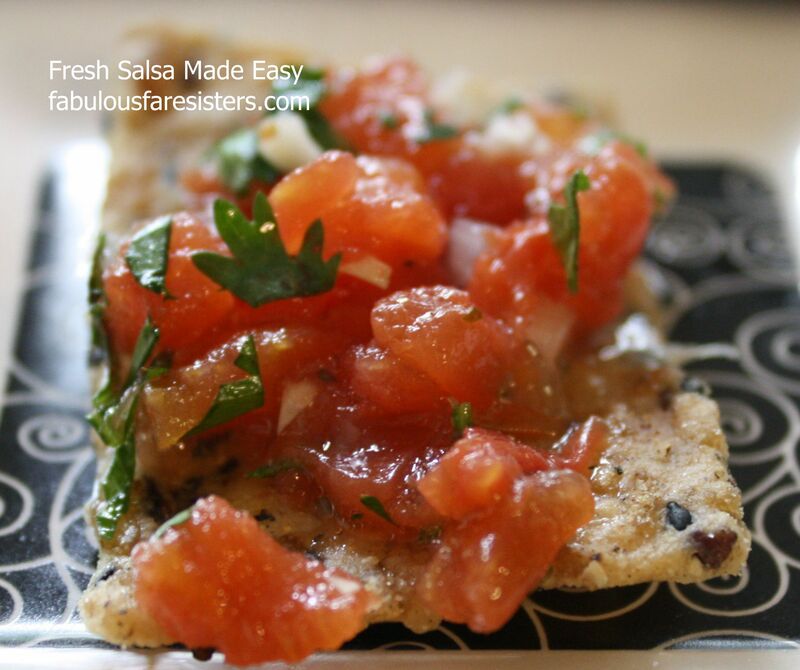 I love fresh salsa and this recipe looks so simple and delicious! I’m actually starting a Link Party on my blog http://www.inthenewhouse.com and the first one is this Thursday. I’d love for you to share this post and some of your other great recipes there. Hope to see you! Hi LELABURRIS, I’m Linda’s sister Heidi, the other half of the ‘fabulousfaresisters’, I’m so glad you liked fabulousfaresisters salsa. We are excited to be part of your Party post. I heat you. I’m still waiting for my tomatoes from the garden… Enjoy! great idea to used the canned tomatoes and rotel! I love fresh salsa, and this is pretty darn close and way better than those jars of processed slime. Jodi, I think the way you do. Sometimes we have to doctor the can, but it can taste fresh if you put a little love in it. This salsa is a winner. Totally! It is so fresh you would think you pulled everything strait from your garden. A winner for sure. Thanks for sharing your recipe. Nice and simple. Thank you. This salsa is an absolute ‘go to’ for party’s and quick appetizer for when I am on the go. A permanent staple in my pantry… I have noticed it is almost always the first empty bowl at a party.